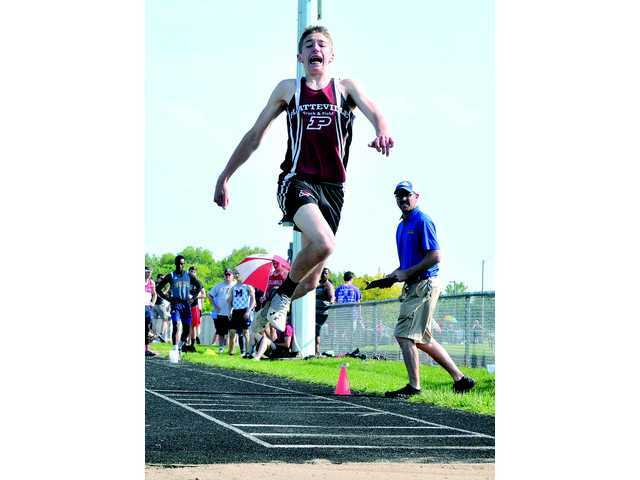 POSTED May 31, 2018 12:02 p.m.
LANCASTER — Platteville senior Brock Schambow bounded, skipped and leaped his way to a new school record in the boys’ triple jump at Thursday’s WIAA Division 2 Lancaster Sectional and in the process qualified for this weekend’s WIAA State Championships in La Crosse. Schambow finished second in the boys’ triple jump with a new school record 44’5¾” to earn his first trip to state. Schambow will be joined at state by fellow Platteville record-breaking senior Skye Digman, junior distance runner Jace Serres, junior triple jumper Tyler Moss, and the 4x100 relay team of Moss, seniors Donovan Blevins and Christian Seamster and sophomore Max Allion. The Hillmen qualified six events for this year’s state meet that will begin Friday at UW–La Crosse. Division 2 and 3 competition begins Friday at 3 p.m. Saturday’s finals begin at 9:30 a.m.
Digman, who set the PHS girls’ shot put record earlier this year and is second on the all-time Hillmen list for discus, won the sectional title in the discus with a throw of 130’4” and finished second in the shot put at 40’9” to earn her third trip to state. She placed 13th in the D2 shot put as a sophomore and 10th a year ago in the event. Digman also finished seventh in the discus at last year’s state meet. Serres placed fourth in the 1,600 with a time of 4:30.39, which is seventh best in PHS history, to earn his third trip to state. He was a member of Platteville’s 4x800 state relays the past two years. Moss finished fifth in the triple at Thursday’s sectional with a distance of 43’6¾”, good for fourth on Platteville’s all-time list, but earned an extra qualifier berth to state. The top four finishers in each event at sectionals automatically qualifies for state, in addition to any individual or relay that places among the eight best of all sectional performances. Platteville’s 4x100 relay Moss, Blevins, Seamster and Allion finished fourth at regionals in 44.43 seconds. Blevins competed at state in the 4x100 last year as a junior. This will be Moss’, Seamster’s and Allison’s first appearance at the state track and field meet. Top 10 teams scores — 1.Monroe 65, 2.Lodi 53, 3.Gale–Ettrick–Trempeleau 50, 4(tie).Platteville 44, 4(tie).Clinton 44, 6.Lakeside Lutheran 36.5, 7.Lake Mills 35, 8.La Crosse Aquinas 34, 9.Dodgeville/Mineral Point 31, 10.Lancaster 30. 1,600 — 4.Jace Serres 4:30.39. 4x100 — 4.Platteville (Max Allion, Tyler Moss, Donovan Blevins, Christian Seamster) 44.43. Triple jump — 2.Brock Schambow 44’5¾”, 5.Moss 43’6¾”. 200 — 12.Jonny Rule 24.79. 300 hurdles — 15.Austin Wein 44.06. 4x200 — 6.Platteville (Seamster, Moss, Osaze King, Blevins) 1:33.27. 4x400 — 8.Platteville (King, Rule, Serres, Moss) 3:30.68. 4x800 — 8.Platteville (Logan Henry, Alex Sonsalla, Calvin Wernimont, Liam Reinicke) 8:50.78. Pole vault — 6.Wernimont 13’0”, 9.Gabe Tashner J12’6”. Long jump — 6.Miles Steckling 20’10”. Triple jump — 14.Steckling 39’3”. Shot put — 5.Ian Carter 46’11”, 14.Austin Jentz 40’8¼”. Discus — 5.Caleb Lueder 154’2”, 6.Jentz 148’5”. Teams scores — 1.Virouqa 60, 2.Lodi 48, 3.Monroe 46.33, 4.Brodhead/Juda 43, 5.Richland Center 42, 6.Edgerton 35, 7.Madison Edgewood 34, 8.McFarland 28, 9(tie).Big Foot/Williams Bay 25, 9(tie).La Crosse Aquinas 25...13(tie).Platteville 21. Shot put — 2.Skye Digman 40’9½”. Discus — 1.Digman 130’3”. 100 — 10.Katherine Kasper 13.71. 800 — 15.Harmony Bell 2:36.68. 1,600 — 14.Brittani Meis 6:02.34. 4x800 — 9.Platteville (Bell, Brittani Meis, Renee Momot, Sierra Wunderlin) 10:35.47. Shot put — 7.Izzy Carroll 34’3.5”, 15.MJ Stephens 29’10”. Discus — 8.Alaina Digman 111’0”, 9.Carroll 107’5”.